1: Q: Just how much will I save on energy bills if I swap my bulbs over to LED? 2: Q: What is the difference between Warm and Cool white? A: Warm white is similar to the colour of halogen, cool white is similar to a fluorescant light and could be described as clinical. see a picture here. 3: Q: What are SMD's? A: These are Surface Mounted Diodes/Devices, they are generally brighter than traditional LEDs. 4: Q: I heard LED fade over time, is this correct? A: Yes, you will hear of LEDs lasting many 1000,s of hours, whilst this is technically correct they will fade over time, the large numbers of hours you may read about only intimate that unit is still working and emitting light. The real usable lifespan of a LED lamp, dependant on usage, is 1-5 years but by then you still have had a massive saving on power usage and the lamps will have paid for themselves many, many times over. 5: Q: Will my transformer operate LED MR16/G4 12v type bulbs? 6: Q: My transformer isn't suitable, what can I do? A: You can purchase a LED driver from us. If you are powering MR16 lamps you can bypass the transformer alltogether and fit a GU10 lampholder and swap to mains powered LED GU10 if appropriate. 7: Q: How much is delivery? A: It depends on the weight and destination, add your items to the cart and fill in the quick address detail field, the system will calculate the delivery charge for you. 8: Q: Can you take my payment over the phone? A: Sure, please order what you need online and select Pay by cheque as your method of payment then give us a ring to complete your payment. 9: Q: When will my order be dispatched.? A: If your order is received by 3pm on a working day it will usually be dispatched the same day, if after 3pm it will be dispatched the following working day. 10: Q: Does the price include VAT? A: Yes all prices are inclusive of Irish VAT, currently 23%, a VAT receipt is dispatched with all purchases. 11. My cart is showing a delivery charge but its supposed to be free? A: The system doesn't know where the delivery is to be made until you tell it, there is a charge for overseas orders, once the system knows where the order is to be delivered it will show correct postage charge or apply Free Shipping. The LED (Light-Emitting Diode) is a semiconductor component where power is passed through a diode resulting in illumination. The first practical LED was invented in 1962 by Nick Holonyak, Professor of Electrical and Computer Engineering at the University of Illinois. Recent improvements in the manufacturing process mean that LEDs are now supplied in the more versatile SMD (Surface-Mount Diode) format which offers a much greater range of colours, sizes, shapes, bases and fixings, and almost limitless design possibilities. The total luminous output of a light is measured in lumens (lm). LEDs generally require only 1/10 the power for the same output as halogens. Lux is the SI unit of illuminance and luminous emittance, where one lux (lx) is equal to one lumen per square meter. Illuminance is the measure of how much luminous flux reaches a given area. Luminous flux can be considered as the total amount of visible light present on a surface and is expressed in lumens, whilst the illuminance is the brightness or intensity of the illumination on a particular surface. Generally the wider spread of light that is used (beam angle) for a given lumens output, the more dim the visible light will be. 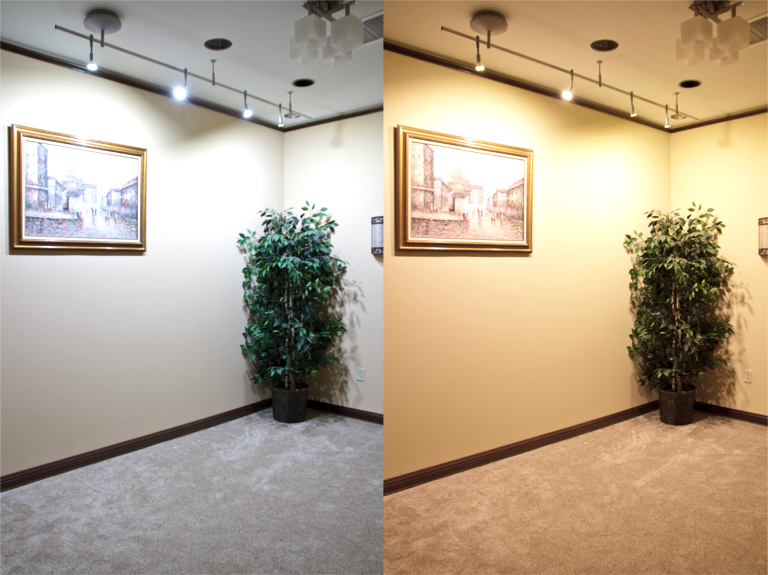 This property can be an important consideration when making decisions about your LED lighting. Beam angle is the angle of the dispersion of a light source. It is generally measured where there is a 50% reduction in lux level compared to the beams intensity at its center. Colour Rendering Index (CRI) measures a lights ability to reproduce a colour spectrum compared to a natural light source (such as the sun), on a scale from 0-100. It is understood that the higher value CRI the better. These images show the spectrum of light reflected from an incandescent (which tend to have a high CRI), compared to a CFL (approximately 60 CRI). Tests have shown that a LED CRI is virtually indistinguishable from an incandescent. Colour temperature is an indicator of a lights 'warmth' or 'coolness', and is measured in Kelvin (K). There is no right or wrong colour temperature, it really depends on the mood you want to create but rule of thumb is, if you are replacing halogen 3200k is about the same colour as you are used to. Traditional forms of lighting are inefficient at producing visible light and emit a considerable proportion of energy in the non-visible infrared frequency range. In particular, halogen. Similar to most solid state electronics, LED lamps require a way to dissipate heat. In fact, heat dissipation is extremely important for LED light design, not only to ensure safety, but also to maintain long service life. Future LED lighting solutions are properly configured, including effective heat sinks, to ensure maximum life span. PLEASE NOTE: Unless stated in the description, LEDs are non dimmable and should not be operated by a dimmer/soft start switch. After choosing your combination of a high CRI and efficacy with the right beam angle and the right amount of lux for your application, we are confident that a Future LED light bulb solution will put you well ahead of the pack, not only in the performance and quality stakes, but with our great low prices as well.